The item Sir Nigel represents a specific, individual, material embodiment of a distinct intellectual or artistic creation found in Evansville Vanderburgh Public Library. 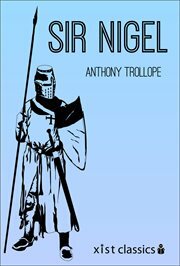 The Story of One Medieval English Hero. Nigel Loring is at a crossroads, his family was ravished by the Black Death and now the local monks have set their eyes on his family's welfare. To make a name for himself, he joins the army of King Edward III of England. Can he restore the family's pride and wealth?